The rich history and many mysteries of New England are the perfect backdrop for Kathryn’s books. Winding roads lined by old stone walls, forgotten cemeteries, grand homes with shadowy pasts... All sparks for her imagination. Whether it’s a quaint seaside town or the vibrant city of Boston, it’s easy for this “hauntingly romantic” author to envision the past mingling with the present. 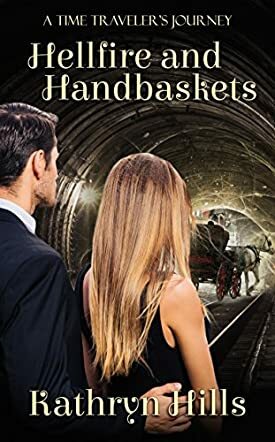 Hellfire and Handbaskets: A Time Traveler's Journey by Kathryn Hills is a stimulating mix of romance and time travel, with an interesting focus on the emotional development of the characters. Rick Hauser is an ER doctor who suffers from PTSD. He has been a combat medic and has seen the worst of humanity’s misery — so he thinks! But when Amelia Pennington, a blue-eyed, charming woman walks in and asks for his help, her beauty gets the better of him. Rick doesn’t know then that Amelia Pennington had always wanted to be a doctor, but it seemed like society, including her mother, had conspired to make that dream impossible. She is a medical student running from a crazy man, running from the oppressive society of Boston, 1895, thanks to the rune stones that allow her to travel through time. While Rick would rather have nothing to do with a woman at this time, he can’t ignore it when he finds Amelia again sleeping on a doorstep. The attraction between the two is strong. But can Amelia leave her life back in 1895 in Boston and will Rick risk everything for this mysterious woman? Kathryn Hills has crafted a spellbinding romance with characters that are rich and believable. Amelia’s background is well explored and it is one of the elements that make the conflict strong. She comes from a family that has many problems, including the illness that afflicted her mother, and an evil man determined to make her life a living hell. Rick is a genuinely flawed character, a man haunted by his past and a character that readers feel sympathy for. The plot is cunningly done and the prose delightful. It is interesting how the language changes, even the dialogues in the 1895 setting. The pacing is fast, and the emotional aspect of the conflict is strong enough to keep readers utterly engaged. Hellfire and Handbaskets: A Time Traveler's Journey is a great achievement and literary entertainment that will certainly delight many fans of time travel and romance stories. Hellfire and Handbaskets: A Time Traveler's Journey is a time travel romantic fantasy novel written by Kathryn Hills. Amelia Pennington was born into wealth and the distinction of being part of Boston’s elite society, but the young woman was anything but happy with her lot in life. The culture of America in 1891 was not accepting of women who didn’t understand their place as helpmates rather than leaders or independent thinkers. Amelia’s desire to become a physician was a thorn in her mother’s side; it was only through the intercession and influence of her more understanding brother that Amelia was granted a place in Boston University’s Medical School. And while that was a grand step forward, Amelia’s mother was slowly wasting away with tuberculosis, which put Amelia’s education in jeopardy, as did the rancor and hatred Professor Lyall Whitman held for her and her family. Professor Whitman’s deadly attack on Amelia compelled her to use the rune stone she had been given by asking it to take her to someone who could save her. Kathryn Hills’s time travel romantic fantasy novel, Hellfire and Handbaskets: A Time Traveler's Journey, is a well-written and enthralling story about the unlikely partnership that arises between a modern day emergency room doctor suffering from PTSD as a result of his service as a medic in the Middle East and an upper class young woman who’s travelled into the future to escape a deadly attacker. I enjoyed seeing how these two equally strong and tormented individuals were able to reconcile their differences. Hills’s characters are credible and finely honed; they quickly became real as I was reading their story. I also loved learning about the power inherent in the rune stones and was fascinated by the mystery behind the Pennington family’s summer estate house. Hellfire and Handbaskets: A Time Traveler's Journey is a grand read that’s hard to put down until you’ve finished the last page. It’s most highly recommended. It wasn’t easy for a woman in the late nineteenth century who wanted to train to be a doctor. Coming from a wealthy family, Amelia has her heart set on being a doctor and finding a cure for tuberculosis so she can treat her mother. But circumstances and a dangerous man in the medical faculty where she studies threaten her life. Little does she know that her race to escape this madman pushes her into the future. It’s still her hometown of Boston, but it’s the twenty-first century and things are quite different. Relieved to have escaped possible death, Amelia seeks help at the hospital where she meets Dr. Rick Hauser, a former military doctor trying to escape the horrors of the men he lost in the battlefield hospitals. Amelia and Rick seem to have an instant connection and, although at first he doesn’t believe that she’s from the nineteenth century, he helps her overcome her horrific nightmares and, in turn, she helps him. Kathryn Hills’ historical fiction/fantasy/science fiction novel, Hellfire and Handbaskets: A Time Traveler’s Journey, is a brilliant combination of history, mystery, fantasy, science fiction and romance. With all the key ingredients of a spell-binding tale of murder, mayhem and daring, handsome rescuers, this novel moves along at a compelling pace from start to finish. The past and present are clearly identified to help the reader adjust to the different time periods, while the nightmares fill in the blanks as the plot thickens. Each character is well developed. At first read, this novel might be considered a sumptuous happily-ever-after romance, but the Epilogue suggests an underlying sinister element of a tale yet to unfold. Perhaps there is another story, a sequel, in the works?